3. Fill in the trunk with brown watercolor paint. 4. Fill in the ground with blue watercolor paint. I would recommend making it very watery, unlike in my example. Or if you have a fancy silvery or glittery watercolor paint, that would look great too! 5. Fill in the sky with water first. Then add purple, red, and a small amount of blue in different places. You can mix areas together. When the area is covered, dip your paintbrush in water and let it drop onto the paper. This will create “blooms” that look like the Northern Lights! 6. While the paint dries, use your hole puncher to cut out a lot of white circles from scrap paper. 7. 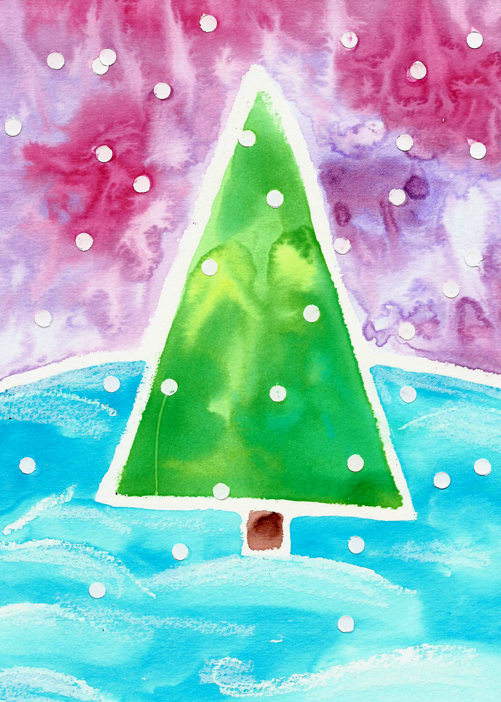 Use glue to add the white circles onto your painting to look like snow! 8. When completely finished and dry, trip the edges. You could glue it onto a larger piece of colored paper to make a frame. This is a great project for children of all backgrounds to make. You may allow some to turn it into a Christmas tree if you would like, but I personally would have my students focus on natural looking trees in the forest. Supplies : blank white cards (mine came from Michaels), 9 pointed star cookie cutters (can be bought from Special Ideas) black acrylic paint, large paper plate, colored pencils. 1. Get out your black paint and spread it evenly on a paper plate. You want it to be thick enough to act as a stamp pad but not too thick. Acrylic paint dries very quickly, so be prepared to add more paint over the duration of this project. 2. 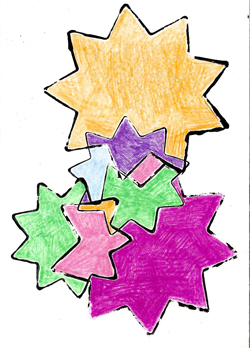 Dip your 9 pointed star cookie cutters in the paint, and press down on the front of the card. Use different sizes and make them overlap. 3. Let the paint dry and get out the colored pencils. 4. Color in each section with a different color. I used Prismacolor pencils, which are a bit more expensive, and I had to work hard to fill in each area. But because the card paper is thin, it would be difficult (but not impossible) to use paint. You can also try markers. This makes a great card you can send to friends and family on Ayyam-i-ha or anytime of the year. And you can use a large piece of paper (I would recommend bristol board) to turn it into an eye-catching piece of artwork everyone will enjoy. If the paint dries on the cookie cutters, just rinse them in very hot water and it will peel off. The students will fill out the scavenger hunt, and each group will choose a new prayer they found that they liked. They will present it to the whole class. This will be the next prayer we work on memorizing in class. 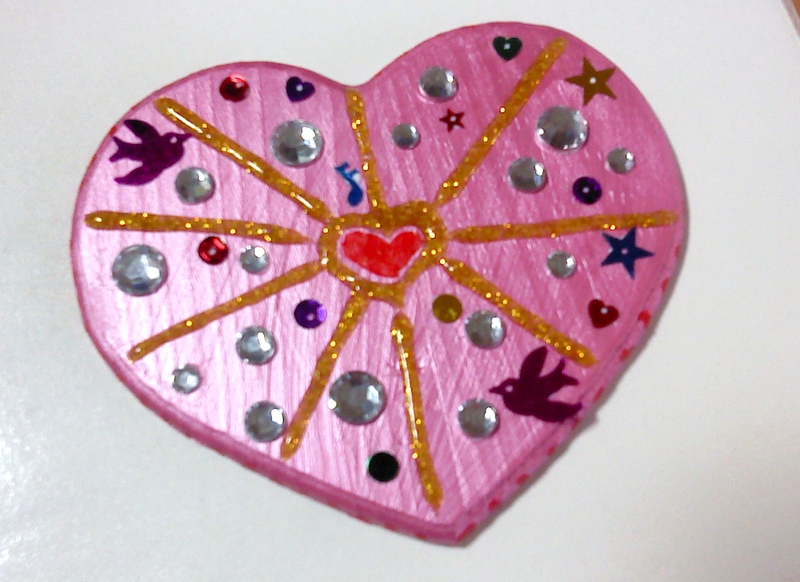 During this activity, teacher will prepare for the Arts and Crafts Activity next. Ahead of time – Use a hot glue gun to make picture frames out of popsicle sticks. Glue a magnet onto the back of each frame. Also, print out the obligatory prayer on nice card stock, large enough to fit in the frame. Students will use acrylic or tempera paint, sequins, foam stickers, ect to decorate their frame. Then they will glue the Obligatory Prayer to the back of the frame and hang it in their locker or on their refrigerator at home. Hopefully I can use this lesson next week! And one of my newest favorite books is The Usborne Complete Book of Art Ideas. I copied this project from the book, but it can be adapted and changed. I thought it goes GREAT with the story of Abdu’l-Baha and the sheep, which can be found in the Core Curriculum book of Baha’u’llah stories, Volume 1. 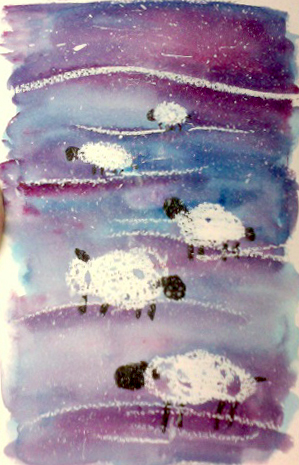 To make this kind of art, use a white oil pastel to draw the sheep’s bodies and some lines on the ground. Then wet the entire paper with water, and use blue/purple/pink watercolors. Make sure the colors run together and mix. I used Windsor and Newton Cotman WaterColours in Intense Blue and Permanent Rose. When the paint dries, use black watercolor or ink to add in the heads, tails, and legs. Let that dry, and then use white acrylic or tempera paint to splatter all over – the book suggests dipping a toothbrush in the paint and flicking it with your finger. I am also working on a Shrine of the Bab drawing lesson. 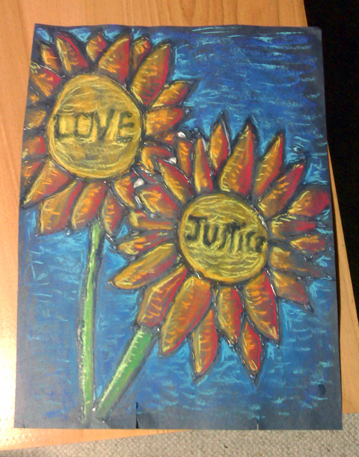 Here is my first attempt, drawing it out first in pencil and then filling in with oil pastels. This kind of project would work best with 4th-8th grade, possibly High Schoolers if they show interest in drawing. And crayons or colored pencils would also work better. That’s it for this week! Hopefully next week I’ll have some more concrete things to share. I was really excited that 3 students attended class today, despite it being Halloween. We played a game where we had to pass a plastic bracelet around in a circle using straws we held in our mouth. It lightened the mood and has us giggling while we realized that working together is noble. We further talked about choices in our lives where we can do the noble thing, or abase ourselves, and how good choices lift our souls close to God like a hot air balloon lifts us off the ground. 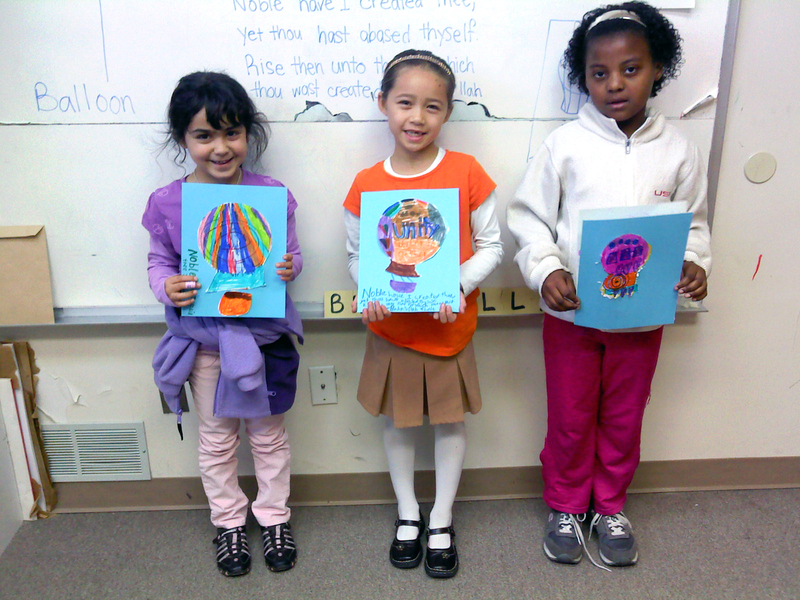 For our art project, we drew Hot Air balloons using this method on white drawing paper using pencil, and then colored them in with marker. Then we cut them out and glued them onto blue card stock. Some wrote the quotation on the front or back of their drawing. 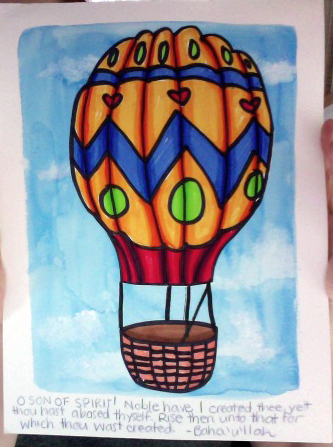 Here is my teacher example – I used blue watercolor paint for my background and then pasted the hot air balloon on top. Here is another art project idea for the extra tissue paper squares from the Sun of Truth project. Materials – Watercolor paper, tissue paper squares, masking tape, black colored pencil, blue watercolor paint, green acrylic paint. 1. 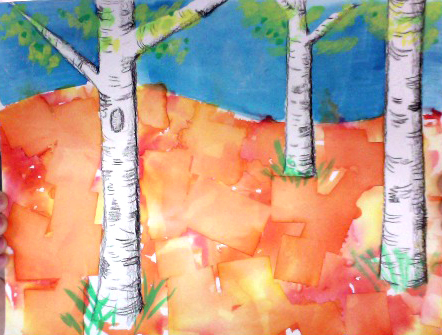 Stick long strips of masking tape on the watercolor paper to make tree trunks. It might help to stick it to your jeans/pants first to weaken the adhesive, so it will peel of the paper easier. Add tree branches as needed. 2. Draw a horizon line across your painting. Then fill the ground portion with tissue paper squares. 3. Use a squirt bottle to dampen all of the tissue paper squares. The colored ink will get runny and it will stain the paper. When it dries, peel off the tissue paper squares. 4. Paint blue water color on the sky portion of the painting. Let dry. 5. Peel off the masking tape to reveal white tree trunks. Use a black colored pencil to gently outline the tree, and shade in one side of the tree darker. (Make all trees match.) then add horizontal lines to make the bark of the tree. 6.You can add green/yellow leaves with paint on top, and blades of grass as desired. Today in our Sunday School class we began our discussion about Baha’u’llah. We talked about how He is the Sun of Truth who is awakening the people of the world to their spiritual nature, and that eventually we will create world peace. 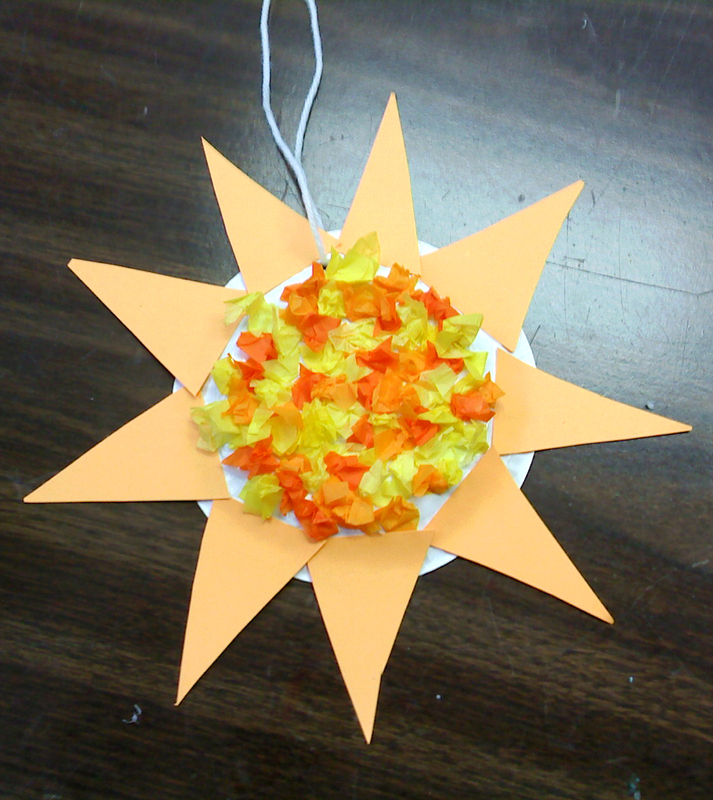 Then we made a Sun craft. Materials : Small paper plates, yellow/orange tissue paper cut into 1” squares, orange card stock, scissors, white glue, yarn, hole punch, and black sharpie markers. Students wrote ” Baha’u’llah is the Sun of Truth” using black sharpie markers on the “eating” side of the plate. Then they flipped it over and covered the back with crumpled up tissue paper squares dipped in white glue. Then they cut triangles out of orange card stock and glued them around the edges of the plate. To finish, they punched a hole on top and attached a loop of yarn to hang it up. 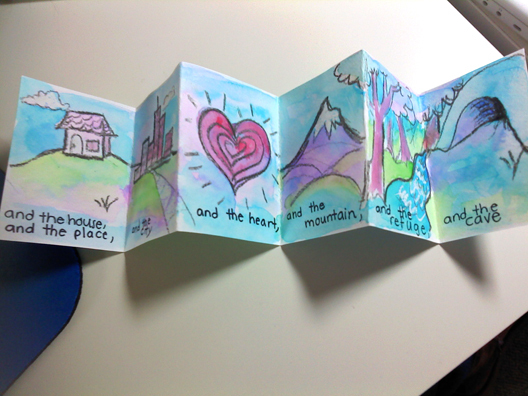 I try to plan craft projects that the children can display in their bedrooms, or homes. This way they serve as visual reminders of the Baha’i Faith during the week. The craft was a success this week, and the students really enjoyed it. I hope they hang it up in their rooms so it reminds them to “awaken” their souls in prayer each morning. We talked about how we try to treat others as we wish to be treated, and heard a folk tale about a family that treated their neighbors with kindness and respect. Here is the finished puzzle – I’ve mounted it on poster board to hang in the classroom. 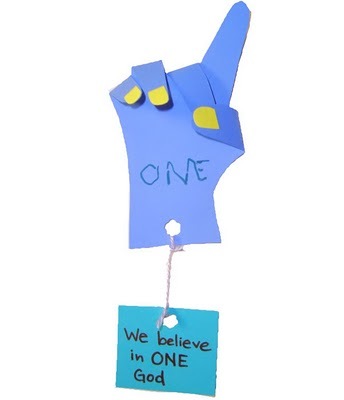 Next week we will be celebrating Global Oneness Day, learning more about our UNICEF service project, and beginning our studies on Baha’u’llah. Objective – Create a lesson for 2nd-5th graders to teach Progressive Revelation. 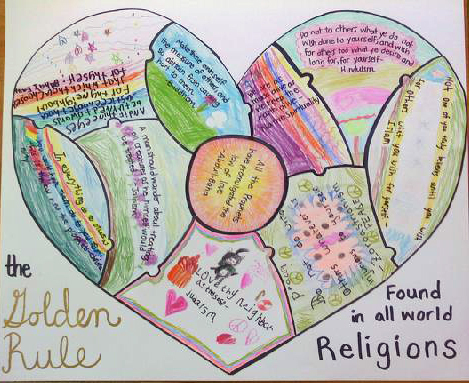 Students will understand that there is One God, One Human Family, and One Religion. Students will understand that God’s Messengers are like mirrors reflecting the light of the Sun (God) and they are the teachers of humanity. 5. Students get worksheet and copy a quote from Baha’u’llah. 6. Students take mirrors outside to scientifically learn a concept. 7. Students draw their observations based on their discovery outside. 8. Children make a craft. 9. Children learn a song. 1. Begin class with prayers. This directs our education towards God and strengthens our soul. 2. Review classroom rules and procedures. This establishes a loving, respectful environment. 3. Teacher introduces the Oneness of God. Introduce the Messengers of God. Use metaphor – Messengers reflecting the light of God and Messengers as the progressive teachers of humanity. Discuss how through progressive revelation, unity of God, God’s Law, Love, Nation, and Humanity were achieved. This uses listening skills. 5. Pass out short worksheet on Messengers as Mirrors. 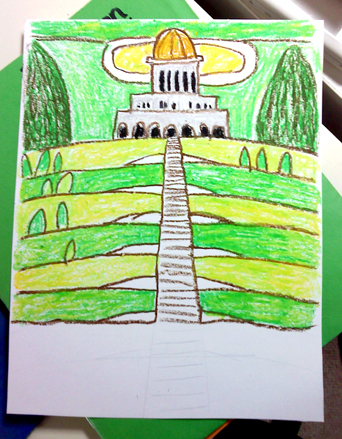 Children will draw a picture of a mirror reflecting the light of the sun, and then copy a quote from Baha’u’llah. This employs the use of writing and reflection. It involves the private study of the Writings and Independent investigation. 6. We take small hand-held mirrors and go outside the school to see what a mirror looks like when it reflects the light of the sun. This involves scientific discovery. 7. Then we go back inside and finish the drawing on our worksheet. This involves critical thinking. 8. Then we make a craft project that reinforces the Oneness of God, Man, and Religion. This engages the eyes, hands, and creative mind. 9. To end the class, we learn and sing a song called “God Is One” which cements the new concept in our hearts, minds, and souls. The class went extremely well. Although I do not plan to use so many different activities in every lesson, I could immediately see which modes of learning the children preferred. For one student, who recently moved here from overseas and is still learning English, he excelled during the scientific discovery portion. I could assess his understanding by his ability to draw what a mirror looked like when it reflects the light of the sun. You can listen to it here: just scroll down until you see God Is One. Today was the first day of the 2010/2011 School Year at the Detroit Baha’i Center. In addition to teaching, I have also decided to serve as the Children’s Program Coordinator for the Baha’i Center. While I spoke with the parents, the children sat at tables on the other side of the room at decorate Pinwheels for International Day of Peace. The parents went back to the main meeting room and children broke off into classes. We restructured classes so that children remain with the teachers they had last year. As such, I am teaching the 2nd-5th graders. I was so surprised to find two new students joined our community over the summer. We had a great class and it made me to happy to see everyone’s smiling faces. We were also blessed by the generosity of community members who donated art supplies and money to provide snacks. Also I felt inspired to try a new drawing technique that I read about so often in the many art teacher blogs I follow. The technique is simple – use white school glue on black paper to “draw” a line drawing. When it dries clear, fill in the drawing with pastels. At first I smudged the pastels, and then I added horizontal hatches to give it an impressionistic feeling. I can definitely see myself using this type of project this year. So all in all we are off to a great start. My name is Emily. I am a college student majoring in art education. I am a member of the Baha'i Faith and an educator of children. I have spent hours exploring the depths of the internet, seeking resources to enrich children's classes. I have awoken in the middle of the night when the idea for a new craft or game has invaded my conscience. This is the sum of my search, my ideas, and my experiences. This is an effort to share them and learn from others.